An exciting programme of over 120 events will be on offer to audiences at this year’s Guildford Fringe Festival, running from 28 June until 28 July across 12 venues from pubs and theatres to a natural burial reserve and the BBC Surrey radio studio. Gag House Comedy Superstars will kick off the festival’s official Opening Night (for the third year running) with an evening of riotous laughter at G Live, with headliner comedians including Hal Cruttenden, Chris McCausland, Susan Murray and Paul Sinha. Hot on its heels, July will be a month full of top arts picks offering everything from music, visual arts and theatre, through to comedy, cabaret, spoken word, children’s events and more. There is a wide variety on the bill to tempt new or seasoned festival-goers whether they are into Simon Brodkin or The Barricade Boys, Arthur Smith or Shakespeare. Amongst the familiar faces, there will be many opportunities to enjoy new writing and discover fresh talent on the arts scene, such as new musical High School Shooticle and Three Times Tables: An Evening of New Theatre, the brainchild of British Comedy Award-winning Guildford-based writer Paul Kerensa. Throughout the Fringe, local talent is at the fore, from Late Night Shorts, performed by Guildburys Theatre Company, to A Bard of Ale, by Co-Founder of Guildford Shakespeare Company, Matt Pinches, and Understatement – a night of new writing curated by University of Surrey students which will include work by Guildford School of Acting’s students. Local folk singer-songwriter Majella Yorston shares her velvety voice and trademark guitar in A Song or Two More, Creaction Theatre Company present two of Alan Bennett’s one-act plays, and the Guildford-based Project GEEYOUONE explore what it is like to live with a disability in the modern world. 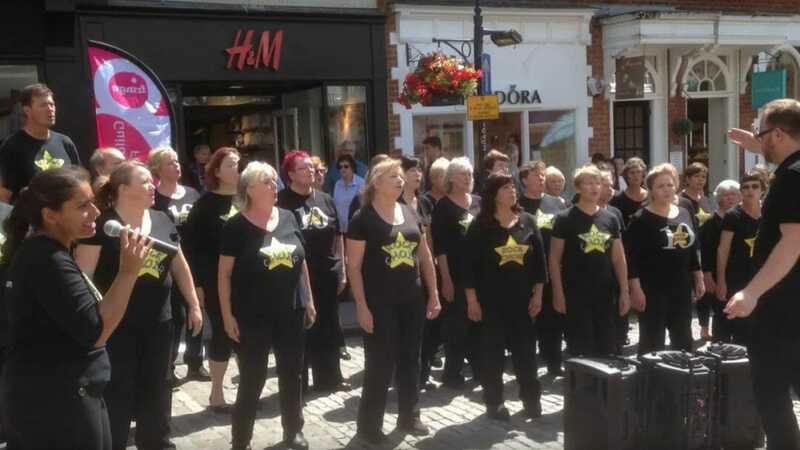 Highlights of this year’s Free Fringe include Guildford’s fabulous Rock Choir, an al fresco performance of Opera on the Balcony at the Guildhall, popular singer-songwriter Gavin Thomas, and Morris Day with its traditional – and not so traditional – dancers showing off their routines. All of which won’t cost a penny to enjoy! Elsewhere in the packed programme, the varied line-up includes 2017 BBC New Comedy Award finalist and ‘wheelchair enthusiast’ Aaron Simmonds, a night of American Songbook jazz with Annette Gregory, the award-winning Russian-British comedian Konstantin Kisin who made headlines by refusing to sign a ‘safe space’ contract for a university gig, and a chance to catch the ‘phenomenal’ Yorkshire comedian Maisie Adam, winner of Amused Moose National New Comic 2018 and So You Think You’re Funny? 2017. The 12 festival locations range from more unusual sites such as Clandon Wood Natural Burial Reserve and the BBC Surrey radio studio, through to traditional entertainment venues including Guildford’s Yvonne Arnaud Theatre and G Live. Performances also take place in relaxed and intimate pubs settings including The Back Room at the Star Inn and The Keep Pub, and, of course, out and about in the streets of Guildford’s beautiful and historic town centre. Visit the Guildford Fringe Festival website, GuildfordFringeFestival.com, for the full line-up and to book tickets. During the Festival, the Fringe Team will be at The Star Inn, Quarry Street, 7 days a week, from 11am-4pm, where they will run a Box Office and be happy to chat about the Festival.